RITA® finalist, international bestselling and award-winning author Robin Perini is devoted to giving her readers fast-paced, high-stakes adventures with a love story sure to melt their hearts. 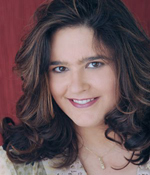 She sold fourteen titles to publishers in less than two years after winning the prestigious Romance Writers of America® Golden Heart® award in 2011. An analyst for an advanced technology corporation, she is also a nationally acclaimed writing instructor and enjoys competitive small-bore rifle silhouette shooting. She makes her home in the American Southwest and loves to hear from readers. 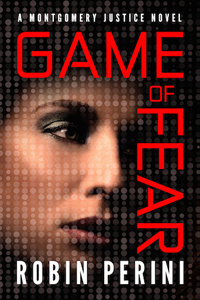 Game of Fear is the third novel in her Montgomery Justice series. 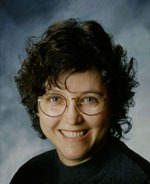 Visit her website at RobinPerini.com. What is your elevator pitch for Game of Fear? “Brilliant kids from all over the country are disappearing—but no one knows why. Until now.” You can watch the book trailer here. What sparked the story idea for the book? Two separate elements came together. One, after reading the story of a female Army Helicopter pilot and her heroism, I knew I had to tell her story. I also knew that she needed a reason to quit a job she loved, so I gave her a mission that was doomed from the start and a sister who needed her. When this pilot leaves the military, she not only leaves her military family, but a distance is created between herself and her father and brothers who are deployed. When the heroine meets the hero—and his family—it’s a reminder of what she has lost. I was able to meet with several military pilots and get some fantastic insights in flying helicopters in combat situations. Amazing bravery, and they don’t get the credit they should. Though, of course, they would never ask for any. And two, with the help of my literary agent and some amazing critique partners, we came up with a crazy premise: Brilliant kids who master the hottest new video game on the market vanish …and no one really notices. Why? Because those who disappear are the kids who hang in the basement, who no one understands, who seem to fade into the woodwork unless they have a controller in their hands. The farewell notes left behind seem to make sense. These kids run away, want to make it on their own. The kids are misunderstood—and forgotten. Except for one girl. One brilliant girl with a sister who doesn’t buy the smokescreen. Deb Lansing’s little sister has been in trouble before now. She hacked into the National Security Agency’s computer system. She got caught. Here is where I must digress. I plotted my book, and as I was writing the story, within a few months Edward Snowden happened. Weird, huh. I kept writing. My plot started down an interesting path that used the internet and webcams and such to spy. Within a few months, the cell phone spying story broke. A little weirder. I kept writing…with trepidation. A member of Congress was spied upon in my novel. Gulp. It happened in the real world. The web of deceit made its way across the globe. To Russia. To Afghanistan. Sound familiar, newsworthy even? I finished the book. Thank goodness. It’s enough to make a writer pause. But then again, sometimes fiction is the means by which the truth can be heard. I spent several months writing about events that made headlines just weeks later. Gave me chills. Tell us about your main protagonists, their flaws and strengths, and what they’re facing in the story. Will those who know you recognize you in your characters? Gabe Montgomery is the youngest of the Montgomery brothers, but he’s been featured in the other two novels in the series, In Her Sights and Behind the Lies. Deb Lansing was briefly featured in Behind the Lies as well. As for Game of Fear … Former SWAT Team Member, Gabe Montgomery, was almost killed in the line of duty through the betrayal of his best friend. Determined to rebuild his life, ferret out the corruption in the Jefferson County Sheriff’s office, and protect his family, Gabe now runs a cop bar as a cover for a dangerous game of less-than-legal investigations into those who abuse their power. His faith in others shaken to its core, the last thing he can afford is to become distracted or involved with someone else’s problems…he could get them both killed. 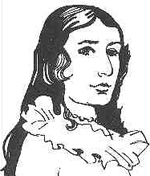 Named after Deborah Samson—the first known woman to impersonate a man in order to join the Revolutionary army and take part in combat—Deb Lansing grew up believing in heroism, honor and truth. Her family has served in the military since the Civil War. As one of the few female military helicopter pilots, she took pride in her heritage. Until she failed on a critical mission. To redeem herself, she flaunts death on Search and Rescue Operations. She will NEVER leave anyone behind. Not again. So when her sister vanishes, Deb will move heaven and earth to find her. No matter what it takes. One way in which these characters are like me is how much they love their family and would do practically anything for them. Which point of view did you enjoy writing the most? In this book I actually dipped into several points of view, but the one I most enjoyed was the POV of the kidnap victim, the heroine’s sixteen-year-old sister. She has her own journey of discovery and her challenges complement the main story in a way I hadn’t expected. I also found it interesting to give this section of the book a bit of a young-adult feel. She was an amazing character to get to know. Did you discover anything that surprised you while doing research for this book? To prepare to write Game of Fear I researched women in the military. My heroine didn’t have a name until I came across Deborah Samson. You may not have heard of her. Not surprising. Her story isn’t well known. I’ve been writing forever, but it’s storytelling that grabbed my interest first. I lost my heart to storytelling when I was a child, sitting at the knee of my great-aunt. She mesmerized me with her tales of “The Little Match Girl” and “How the Tiger Got its Tail.” She wrenched my heart, made me laugh and cry. She fed my love of reading and learning. Perhaps it was inevitable that I followed in her footsteps. My love of writing was her gift as well. When I was eight, I attended a Camp Fire Girls’ camp for a week—it seemed like a month. I wrote tear-stained letters to my great-aunt, and after I returned home she told me I had a gift for writing. That my letters evoked pictures in her mind. My great-aunt has long since passed away, but I look up and smile sometimes. My inner fire for storytelling and writing was her gift to me. I pray I do her justice. I’m actually one of those irritating morning people. I write from 5:30 am-7:00 am weekdays before the day job. Mostly to get the adrenaline pumping because I thrive on deadlines—and being panicked! If you only have an hour and a half, you have to make the most of every second. Also, I write in sprints. Twenty minutes of writing and a 10-minute break. This idea was introduced to me by my fellow writer Angi Morgan, and it really works for me. If nothing else, my body doesn’t go numb from sitting in the chair. In fact, every twenty minutes we meet in a free chat room and report how many words we’ve written (you can get chat rooms at chatzy.com). For ten minutes we brainstorm, discuss, whine, stretch, whatever. It’s a great way to keep pushing through. On Saturdays, I write for about five hours in the morning, and on Sundays I write for three hours. I’m a secondary caregiver for my mother, who has Alzheimer’s, so this time has to be agile. I try to write 16-20 hours per week if at all possible. I call myself a planner…not quite a plotter, not quite a pantster. Before I start writing I develop my stories from the characters out, using a method called Discovering Story Magic which I developed with author Laura Baker. I might start with a basic plot idea, a location, a news story or a character. Whatever I start with, however, I first identify a character that will work with that idea. I then explore my character’s strengths, weaknesses and deep character. From those emotional elements, I create the plot. I start with turning points, then fill in the rest of the scenes. I try very hard to ensure that the plot of my story forces my character to face his or her greatest fear and flaw, and that each character has the strength to help the other. I’ve learned over time that I MUST clearly understand the emotional arc of my characters before I start my story. I’ve spent a lot of time studying human behavior and what makes people behave the way they do, so hopefully this authenticity comes across in my stories. After I work through the plot, I write the synopsis. This allows me to test the logic and drama of the story. It’s also easier to write the synopsis when I don’t know everything that’s going to happen. Finally, I write the book, which is always surprising. Secondary characters and scenes and even subplots come out of nowhere. Just because I plan a book, doesn’t mean I don’t relish in the discovery. I write in fast-draft form which usually includes basic dialogue, blocking and some emotion. It takes between 5-7 weeks for me to complete the draft, which is about 75% of the final word count. I then revise. It takes somewhere between 5-10 hours per chapter to revise the book. I go through a few more rounds of edits before I turn the story into my editor (hopefully). I should add that everyone’s process is different. There are as many ways to write as there are writers, so whatever works for you, stick to it, but don’t be afraid to try something new either. Play to your strengths and use tools to diminish or overcome your craft weaknesses. Learning is a life-long process that doesn’t end. And that makes writing so much fun. Okay, that’s not quite true. I prefer having writ to actually writing. And I prefer both to revising. Who are your favorite authors and what do you admire most about their writing? I have so many authors who have brought me incredible joy since I was a child. In fact, on my website I have included pages listing many of my all-time favorite books and authors. Those books typically evoke deep emotions within me. They are my window into pain, joy, insight, and wisdom. One of my favorite authors is Sharon Sala. This New York Times Bestselling Author has written novels that twist my heart through a painful journey, but end in hope. Her ability to touch my soul makes me go back to her stories again and again. Even more than that, Sharon Sala is a mentor to me. She read my first published novel, In Her Sights, several years ago. She believed in me and my book at a time when it was hard to believe in myself. I’m not sure I would be here today without her encouragement. She is an amazing writer, of course, but an even more amazing person. I’d like to be her when I grow up. In general I have two basic themes that recur in my writing. They include the concept of wearing masks—hiding your true self beneath a mask. The other theme is the idea that it’s not your past or your family that determines your future or your value, but your actions in the here and now. Both of these themes resonate with me emotionally and give authenticity to the emotions in my writing. What are your strengths as a writer? After completing ten novels, is there anything you still struggle with in your writing? I believe I have a good sense of drama and the ability to create characters that people connect with. I also really enjoy creating interesting villains. If I believe my reviews, I write page-turning romantic suspense that readers can’t put down (I can live with that!). What do I struggle with? Oh, where should I begin… in short, revision. Hands down. Because once I complete my fast-draft and have the bare bones of the story, then I go through an agonizingly iterative process where I hope to tease out the heart and soul of the story, activate the scenes, develop deep point of view and so much more. I probably add another 25% to the word count after my fast-draft is completed over at least three to six iterations. I think it was Jack Bickham, the noted writing instructor, who said, “Good novels aren’t written. They’re rewritten and revised.” That may not be true for everyone, but it’s definitely true for me! What advice do you have for beginning or discouraged writers? 1. Study the craft…always. This may seem obvious, but life can interfere with writing and learning, as I’m sure many of you know. Over the last decade I’ve worked full time, gone to school at night for my Master’s degree, survived a serious illness, and am a secondary caregiver to my mother. The most important thing I’ve done for my writing, however, is study the craft of writing and storytelling. I was lucky enough to teach an amazing online class with author Laura Baker called Discovering Story Magic. The class required me to analyze other writers’ stories. One of the best ways to learn is to teach. I highly recommend developing workshops that require you to understand the craft. It’s been a blessing to me. This advice goes hand-in-hand with a second bit of advice. Never stop learning and growing as a writer. 2. Trust yourself. I don’t know about you, but sometimes I look in the mirror and wonder how I’ve fooled everyone for so long. Don’t do the same thing! Trust your instincts. Believe in yourself. Listen to your gut. I had to learn this lesson the hard way. I had to really decide who I wanted to be as a writer. I tried writing numerous books in numerous subgenres. But I finally discovered the kind of stories I really want to tell. I love optimistic stories of suspense. I love heroes and heroines who grow and change and win. I love poignant love stories. That’s what I do. 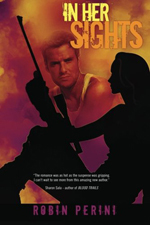 My readers step into the crossfire with heart-stopping suspense and heart-wrenching romance. That’s a Robin Perini book. Know who you are as a writer. It will help when you doubt yourself. 3. Persistence. Get a motto: Mine is: “Never give up, never surrender.” My theme song could be Tubthumping – “I get knocked down, and I get up again.” Don’t get me wrong, there are times I almost quit, but for better or worse, I am a writer. If you want something badly enough, don’t let the setbacks stop you. Learn more, grow more, find your path, find yourself. You’ll be glad you stuck with it. I know I am. I’ve just completed the edits for my July 19, 2016 release, Forgotten Secrets, which is book one of my new Singing River Legacy series. Forgotten Secrets is a very special project for me. I mentioned earlier that my mother suffers from Alzheimer’s disease. I will be donating 10% of the royalties I receive from this book to the Alzheimer’s Association, an organization that has helped my family in more ways than I can count. Here’s a brief blurb of the new story. For Riley Lambert, being an FBI profiler isn’t just a job, it’s a calling. At the age of ten, she witnessed her twelve-year-old sister’s abduction from her bedroom. Fifteen years later and still searching for her sister, Riley has been called to another kidnapping, this time in the small Wyoming town of Singing River, to save a doctor snatched in the light of day. To complicate matters, her only witness, the woman’s grandmother, is afflicted with Alzheimer’s. Battling against few leads and little time, Riley delves into a small town’s secrets with help from the missing woman’s brother, Navy SEAL and Acting Deputy Sheriff Thayne Blackwood. Can Riley decipher enough evidence to save Thayne’s sister, even as her past and his present collide in a shocking revelation no one could expect? My current work in progress is called Rodeo Justice, and is the 8th Carder Texas Connections novel. I will be completing this story on April 1. First off, I want to thank you for taking a chance on a new writer, for taking a chance each time you open a book in the hopes that the story will mean something to you. If I could give any advice, it would be to keep reading and share your love of reading with others so that the world of stories and books expands and grows and remains strong. Secondly, in today’s world, reviews help other readers find books they might enjoy. If you enjoyed a book (or even if you didn’t), consider leaving a review on the retail site(s) of your choice and/or Goodreads. Finally, there’s nothing more I love than connecting with readers. You can read excerpts, read reviews, sign up for my quarterly newsletter or mailing list, check out my book trailers and even request trading cards or an Authorgraph on my website. I’m also on Twitter, Facebook, Goodreads and Pinterest. And, if you enjoy my stories, you may want to consider being part of the Rockin’ Robins, my street team. There are lots of special giveaways and more. In fact, you might get a sneak peek at Forgotten Secrets if you join in the next few weeks! This has been so much fun. I really enjoyed sharing a few factoids about me and my writing. So… you learned something about me today, I’d love to learn about you. In the comments, I’d love to know one unusual fact about you, or what type of stories you like to read, who your favorite author and/or book is… pick your poison. Comment and you will be entered in a random GIVEAWAY of an e-book of your choice from my backlist. Still wondering if you should enter? Below is an excerpt from Game of Fear. The whirr of the circling Bell 212 helicopter rotors echoed through the cockpit. New Mexico’s Wheeler Peak, barely visible in the dusk, loomed just east, its thirteen-thousand-foot summit laden with snow. Deborah Lansing leaned forward, the seat belt straps pulling at her shoulders. Far, far to the west, the sun was just a sliver in the sky. “It’s almost dark, Deb. We have to land,” Gene Russo, her local Search and Rescue contact, insisted. Deb squinted against the setting sun; her eyes burned with fatigue. They’d been at it for hours, but she couldn’t give up. Not yet. A metallic glint pierced through a thick carpet of snowpacked spruce. “There! I saw something.” Deb’s adrenaline raced as she shoved the steering bar to the right and down, using the foot pedals to maintain control. He didn’t understand. The bird knew exactly what Deb wanted, and she didn’t leave people behind to die. Not after Afghanistan. She had enough ghosts on her conscience. She tilted the chopper forward and came around again, sidling near the road toward Taos Ski Valley where the church bus had been headed before it had vanished…. Very much an honor to be included. Thank you!